The last New Comic Book Day of February has passed! With another month out of the way, more and more new comics have been published. If you’re a new reader, it can be daunting. But don’t worry! This week I’ll take a look at four new books and decide if a true Comic Noob could jump in. It’s a bit heavier on indie titles this week than usual, but that only shows how diverse the selection of indie books are. 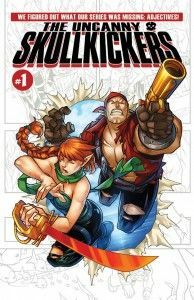 Let’s start off with Uncanny Skullkickers #1! Jim Zub and Edwin Huang have finally given Skullkickers what it was severely lacking: adjectives! It’s a way for Zub to poke fun at many comic companies constant rebooting/relaunching/reimagining mentality, but it really just means a great new arc for readers. This fourth story arc of the action/comedy/fantasy series starts with the series taking a new direction, but keeping all of the same fun and charm that it’s known for. The issue starts with a couple pages of recap before the story is tackled. Rex and Kusia wash up on a tropical island after all the events that occurred in the last arc on the Mermaid’s Bottom. They immediately go about finding food and shelter, though in very different ways. During the night, they’re attacked by what else but turtles! The next day they explore the island more and find some other inhabitants: horned apes! Zub constantly writes stories that leave me with a huge grin on my face. They’re fun with great characters and a unique charm. It’s sound effects like “CHOKEGARGLESPUTTERRETCHAN’HEAVE” that add to the fun and goofy world that is Skullkickers. Huang’s art works perfectly with the story and action to make this issue both a fun read and great to look at. Great story, great art, and a great recap. This is how a jumping on point should be. Everyone, both new and old, is brought up to speed and the story is such a fantastic read that everyone will be back for the next issue. New readers, you can’t go wrong here. Parental Concern: Mild to moderate. Violence. Turtle-related carnage. A spot of language. Jimmie Robinson (almost) singlehandedly brings us Five Weapons this week. It’s a story of assassins and how the mind might just be the mightiest weapon. If you’re a top assassin, you don’t want your kid going to a “normal” school. Instead, you can have them go to the School of Five Weapons. It’s a prestigious academy catering to the finest hired killers and their kids. The newest student is Tyler Shainline, the son of the famed Shainline family. He’s the hottest commodity at school, and needs to choose between one of the five weapons: blades, staves, guns, exotic weapons, or archery. His first day goes worse than planned when he decides not to take a weapon and it’s revealed that he may not be quite who we think he is. The art and story are right in sync, almost assuredly due to Robinson pulling double duty on both. He also does lettering with Paul Little providing colors. The story is quite unique with some fun characters and smart dialogue. The art is crisp and is only complimented by Little’s great colors. It’s fun read with great pacing and an ending that will make you want the second issue immediately. This is an issue with tons of great features that make it a perfect starting point for new readers. 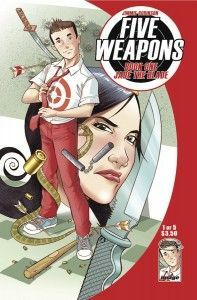 It’s not your typical comic, but it’s what comics should be: fun, enjoyable, and a great read. The Rocketeer is a hero right at home in the Golden Age of comics. He fights Nazis, uses a jetpack, and has a feisty girlfriend. Cliff Secord happened upon a prototype jetpack after a failed robbery and has since used it as a way to fight crime and further fulfill his love of flying. Cliff and his girlfriend Betty have a date, which Cliff is running off to. In the process, he loses his wallet and almost collides with an airplane. He arrives only ten minutes late to his date and it goes well until he and Betty have a bit of a spat. Each go their separate ways, with both getting into a spot of trouble. In the last few pages a seemingly supernatural force is introduced that is surely the titular horror. Roger Langridge creates a story that’s right at home in the late 1930s. It’s fun, light-hearted, and more than a little goofy. The art by J. Bone helps make the story a fun read. Jordie Bellaire’s colors help the crisp art become so much more. It’s an all-around great read from a stellar creative team. 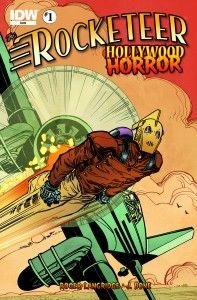 Whether you’re new to the Rocketeer or new to comics in general, this is a great read. Pick it up, read it, love it, and read it again. Parental Concern: Minimal. Mostly wholesome fun. A 0.1 issue is a bit odd, all things considered, but Marvel is giving it a shot. This issue is a way to set up next month’s Guardians of the Galaxy #1 with a back story of protagonist Peter “Star-Lord” Quill. 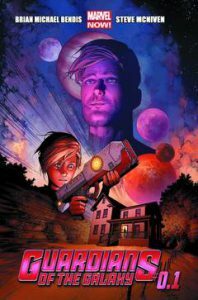 The issue starts with an alien craft crashing in Meredith Quill’s yard. The inhabitant is alien royalty, Spartax, and is in need of some medical attention. Meredith nurses him back to health, allows him to stay and fix his ship, and eventually makes a bit of romance. He then has to leave to rejoin the perpetual war that his people are fighting. Cut to ten years later, and Badoon aliens come to the house looking for the last surviving Spartax heir: Meredith’s son Peter. They kill his mother and destroy the house, leaving him alone and with a chip on his shoulder. Back in the present, Tony Stark has heard all he needs to hear from Peter Quill and agrees to help him out. Brian Michael Bendis is responsible for roughly half of Marvel NOW! by my last count. Though he’s writing a huge number of titles, it’s showing no sign of hurting the quality of his work. GotG starts the series off with a strong showing, and if this is representative of the entire series, this will be a book worth reading. Steve McNiven and John Bell do pencils and ink, respectively, and give the book a very clean look with some great visuals. It’s a superhero book with style, and is sure to pull some readers in. Another great book from Marvel NOW! which is sure to do exactly what Marvel wants: grab new readers. It’s a great new series for comic noobs to jump into on the ground floor. Parental Concern: Moderate. Language and violence. A handful of new books for you guys! It’s a great crop this week and it was tough to narrow down to just four. Until next week, enjoy these Comics for Noobs!